Felix and Feige Bandos met in Bergen-Belsen and escaped to the US. 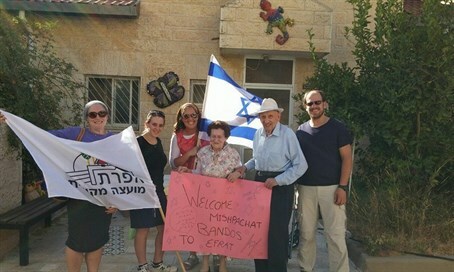 Now, at 90 and 84, they make the brave move to Israel. They met in the Bergen-Belsen death camp, got married - and immediately after World War II, they were able to escape the clutches of the Nazis and emigrated to Sweden, where they lived for five years before moving to the United States. Now, decades later, and at the ages of 90 and 94, Feige and Felix Bandos realized their dream and immigrated to Israel. They made their home in the local council of Efrat in Gush Etzion, Judea. Marilyn Broder, the couple's daughter who has been living in Israel for over 25 years, says that at first she couldn't believe her parents were making the move. Oded Revivi, mayor of Efrat, also praised the new couple. "In recent years, the Efrat Local Council has taken in hundreds of new immigrant families, both from the US and other countries," Revivi stated. "We are proud of these families, like the Bandoses, who strengthen the hold of our land and allow the Efrat Local Council to flourish." "We are very pleased to immigrate to Israel," the Bandoses stated to Arutz Sheva this week. "We want to live near our daughter and grandchildren while we have time left."